This stuffed mushroom recipe was shared by Sharon. The mushrooms are stuffed with a savory mixture of bread crumbs, green onion, and Cheddar cheese. Wash mushrooms quickly under running water; drain on paper towels. Pull stems from mushrooms and chop finely. Melt butter in a skillet over medium-low heat; add chopped mushroom stems and onion. Sauté until tender. Stir in Worcestershire sauce, soft bread crumbs, cheese, salt, and pepper. Sprinkle salt over mushroom caps and fill with sautéed mixture, mounding over the top. At this point, you may cover and refrigerate these mushrooms for up to 24 hours. 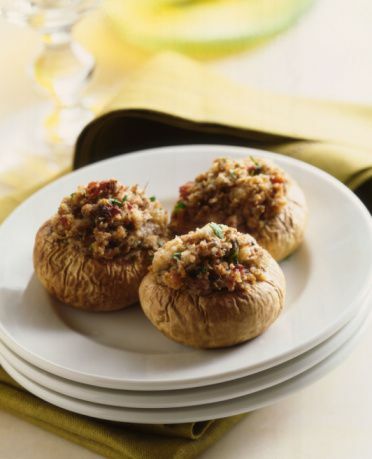 Before serving, put 2 tablespoons of water in a shallow dish and arrange stuffed mushrooms in a dish. Bake for about 20 minutes. Serve hot. *Soft bread crumbs: Put bread on cutting board and use fork tines to tear off crumbs, or use food processor to make finer crumbs. One standard slice of bread makes about 1/2 cup of lightly packed crumbs.